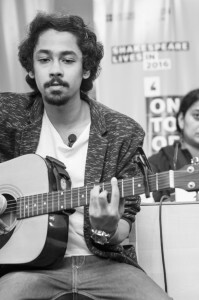 Posted in Look East on April 28, 2016 by Shonali Ganguli. Four hundred years later, we still appreciate the world’s favourite playwright, William Shakespeare. His legacy of written works ensures his relevance to society, past and present. His characters and stories reveal universal truths about the human condition in a way we can all relate to; whether it is the tragic outcome of unchecked greed and ambition, an unrelenting desire for revenge, or the pursuit of love. His representation of human nature is just as real and as relevant today, as it has been through the centuries. Even now directors and producers all over the world make films which are inspired by Shakespeare’s dramas. One such movie is Omkara, directed by Vishal Bharadwaj, an Indian director. The film is inspired by Shakespeare’s Othello. I have recently watched this movie and it kept me spellbound. Vishal Bharadwaj had a vision to turn Venice’s Othello into Meerut’s Omkara and he made sure that vision turned into an epic reality. Omkara is a superlative and exhaustive work of passion and tribute, skill and style. What stands out the most is how most of the characters are dynamic and they teach us a lesson. There is a huge sense of catharsis at the end of the film which I liked the most. Characters like Indu and Omi grabbed my attention. The characters are very strong characters in a different way. Every actor does their part beautifully, but Saif Ali Khan is brilliant as Langda Tyagi. His dialogue delivery and authentic character lends Omkara strength. To sum up, Omkara is about revenge, love for money and power, dark politics and jealousy. It is one of the rare movies where the antagonist receives more empathy than the protagonist. The movie is superb and is a must watch for cinephiles. A noteworthy work as far as Shakespeare’s comedies are concerned, Much Ado About Nothing needs no introduction. The wit of the characters, the excellence of the plot and the occasional powerful humour makes the play an unforgettable experience. When such an immaculate plot is handled by a director as talented as Kenneth Branagh, it is bound to be a visual delight. Directed and produced by him, Much Ado About Nothing compels admirers of Shakespeare to appreciate ‘the loftiest hill’ even more. There have probably been far better Shakespearean adaptations in the history of cinema, but this work has influenced me the most. Through the skills of Branagh, both as an actor and as the director, justice has been done to the work of Shakespeare. The gentleness of Hero, the wit of Beatrice, the credulity of Claudio, the wisdom of Friar Francis, the villainy of Don John and so on have been dealt with in the best possible way. Moreover, Emma Thompson as Beatrice and Kenneth Branagh as Benedick have not failed to captivate the audience with their expressions. Although the play is a comedy, there are certain serious elements that enrich the plot. First, the way Benedick voluntarily parts from his dearest of kin to stand beside the lady he loves is unprecedented. Beatrice too plays the role of a woman of strength by not deserting her cousin even in the roughest of circumstances. Through the film, Branagh rightfully glorifies them. On the other hand, the viewers are away from disappointment as he equally vilifies the diabolic nature of Don John and the changeable and credulous mind of Claudio. There are numerous aspects in the play which reflect what the qualities of a true human being should be. Apart from qualities like loyalty and chivalry, the playwright conveys the definition of a true man through Benedick. Thus the work has permanently occupied a little niche in my heart. Of all Shakespeare’s adaptations I have watched till date, the one that has impressed me the most is the 1996 American romantic drama “Romeo + Juliet” directed by Baz Luhrmann starring Leonardo DiCaprio and Claire Danes in the leading roles. While there are several reasons to love this movie, the main reason is that it has successfully reproduced the ambience of romance as was done by Shakespeare in his original play. Set in the late 20th century, it has slight alterations in settings, characterisation and description of plot while retaining the original dialogues of the play. The context of the play is perfectly put up. The exchange of contemptuous dialogues between the Capulet and Montague boys and their fights reflect the terrifying spirit of violence whereas the development of love between the two lovers amidst the hostility is truly admirable. The portrayal of the ball dance in the party scene is simply marvellous and the fanciful costumes and familiar music delights the audience. The scene of Romeo and Juliet’s first acquaintance is mesmerising. Their subsequent falling in love, giving way to a secret proposal and marriage, also adds a pleasing note to the plot. The tragic ending of the film evokes immense pathos and thus makes the film sensational and heart-touching. The tear-jerking scene of the lovers’ death also leaves a deep impact on the viewer’s mind. The background music is skilfully matched with the settings. Numerous references to pop culture add a new glamour to the plot. This film teaches its audience the basic moral precepts inherent in the story. Replete with terror, romance, humour, pathos and glory, the movie seems to be the most fascinating interpretation of the classic Shakespearean play. Posted in Look East on July 26, 2013 by Sujata Sen. Together they covered six of the thirteen States of east and north-eastern India: Orissa, Chattisgarh, Jharkhand, Assam, Bihar and West Bengal. 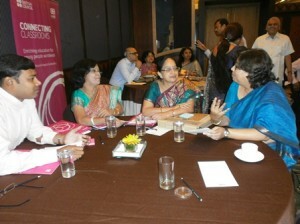 They were principals and International Coordinators of fifteen schools getting together in Kolkata for a common cause: as British Council School Ambassadors they connect their own classrooms and guide new schools to connect with far flung corners of the world http://www.britishcouncil.in/programmes/schools/connecting-classrooms. Connecting a remote school in Kansbahal, Orissa to other parts of the world was what Rashmi Mishra managed to do. Technology was the great leveller. “The teachers resisted it at first because they felt that the ISA project was an extra something they didn’t need. When they found out that this could contribute to the now compulsory CCE (Continuous Comprehensive Evaluation) under the CBSE system, they signed up readily”, says Rashmi Mishra. Lorraine Mirza is just back from a trip to the UK. “ISA stimulated us, it is so progressive and takes you one step beyond your present thinking,” feels Lorraine. Each of them had a story to tell which reaffirms your faith in our teachers. They were pushing boundaries for themselves and their students and helping create a better world. They were enjoying themselves too. Later this year Kolkata hosts the British Council School Award Ceremony 2013 where over 200 schools from across India will receive recognition for their work in different areas. Posted in Look East and tagged Bihar on July 8, 2013 by Sujata Sen. They have no electricity but they have enthusiasm. They have no lunch during the seven hours that they are there but they have a thirst for knowledge. Thirty kilometers from Patna, the capital of the State of Bihar, a three-kilometre dirt track leads to Anugraha Narain Sarvodaya High School in the middle of paddy fields. A wide-angled view reveals little else in the surroundings. A few bicycles are indicators that there is activity inside the building. The school has been there for over 50 years and it is now being proposed as a “model school” for Bihar with increased funding allocation from the Government of Bihar. There are nine teachers but only two functional classrooms, so seven teachers sit around while two take classes. The Principal, Binita Richards, is one of the 170 Teacher Educators under the Bihar Language Initiative for Secondary Schools (BLISS), being run by the British Council in partnership with DFID and the Government of Bihar. She is keen to practice what she has learnt. She travels sixty kilometres every day to do that, ahead of time as the school bell rings, a ready reference point for the 500 students who clutch on to the little that they have in terms of access to education. “Out of 300 students who take the school leaving exam every year, almost 50% succeed,” she says wiping her forehead with one hand and fanning herself with a palm leaf fan with the other. “Our alumni consist of doctors, engineers and bankers and that’s because they have a tremendous desire to learn”. The two classrooms are full. Crowded benches, frayed tables. The girls and boys are poring over their books undistracted by our presence in the corridor. Binita enters a classroom and begins an activity-based lesson. There is no space for group work, so she opts for pair work instead. There’s a buzz and she gets a quick response whenever she asks a question. She moves around the class and supports a pair that looks a bit lost. The sound of a Kohler portable generator next to the classroom drowns her voice so she has to double her effort to be heard. The generator supports the computer room, the only place that has electricity, and internet connectivity, in the premises. There are a dozen computer terminals and a brand new plasma screen. Bijayendra Kumar Dubey, the computer teacher, has a Masters Degree in Computers Applications from the Indira Gandhi National Open University. He teaches them how to write emails, do spreadsheets and prepare documents. The students have two computer classes per week and they adapt to it like duck to water. “All high schools students are given Rs 2500 by the Government to buy a bicycle”, says Binita. “Some of them were enrolling in two schools to get two bicycles but the new rule is that you have to have 75% attendance in a school to get one,” she adds. Priya Kumari, a student of class nine, still doesn’t have a bicycle as the required attendance is still a few months away, so she walks ten kilometres through the paddy fields, where her father tills the land, to attend class. Her six siblings go to primary school and she’s hopeful of making it to college. My colleague hands her a tablet pre-loaded with British Council English lessons. Her classmates crowd around and it takes them only a few minutes to figure out how to use it. “What if all them had a tablet?” my colleague thinks aloud. What if…? We leave with that vision of India in our minds, battered by heat and dust but inspired by those young people who believe that their only hope in life is through education.